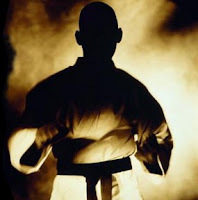 Plastic Zen was one of the definitions Draeger gave of the martial arts. In Zen, the ultimate goal (usually acquired through meditation) is a realization of the unconscious called satori. If the real enemy is truly within, then knowing this aspect of ourselves allows us to withdraw our projections of a so-called enemy without. Jung called the repressed self The Shadow. The Shadow is the anti-self, the alter-ego which is in opposition to who we regard as ourself. The Shadow, by its nature, is unknown to the egoic-self, and herein lies the problem: Conflicts between people, and on a larger scale, wars between nations, erupt when negative attributes are projected onto them. So "they" become the enemy. Jean-Paul Sartre wrote, "Hell is other people". But Jung posited that the only way we can see any quality in others(good or bad) is to actually have ownership of it ourselves. Realizing this brings us closer to understanding a very important characteristic of the martial arts.
" the only way we can see any quality in others(good or bad) is to actually have ownership of it ourselves." What a deep thought! Thank you for introducing me to this idea.. I will contemplate it for awhile.